(Phys.org) -- The oceans teemed with life 600 million years ago, but the simple, soft-bodied creatures would have been hardly recognizable as the ancestors of nearly all animals on Earth today. Then something happened. Over several tens of millions of years  a relative blink of an eye in geologic terms  a burst of evolution led to a flurry of diversification and increasing complexity, including the expansion of multicellular organisms and the appearance of the first shells and skeletons. The results of this Cambrian explosion are well documented in the fossil record, but its cause  why and when it happened, and perhaps why nothing similar has happened since  has been a mystery. New research shows that the answer may lie in a second geological curiosity  a dramatic boundary, known as the Great Unconformity, between ancient igneous and metamorphic rocks and younger sediments. "The Great Unconformity is a very prominent geomorphic surface and there's nothing else like it in the entire rock record," says Shanan Peters, a geoscience professor at the University of WisconsinMadison who led the new work. Occurring worldwide, the Great Unconformity juxtaposes old rocks, formed billions of years ago deep within the Earth's crust, with relatively young Cambrian sedimentary rock formed from deposits left by shallow ancient seas that covered the continents just a half billion years ago. Named in 1869 by explorer and geologist John Wesley Powell during the first documented trip through the Grand Canyon, the Great Unconformity has posed a longstanding puzzle and has been viewed  by Charles Darwin, among others  as a huge gap in the rock record and in our understanding of the Earth's history. 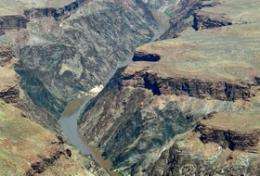 But Peters says the gap itself  the missing time in the geologic record  may hold the key to understanding what happened. "The magnitude of the unconformity is without rival in the rock record," Gaines says. "When we pieced that together, we realized that its formation must have had profound implications for ocean chemistry at the time when complex life was just proliferating." "We're proposing a triggering mechanism for the Cambrian explosion," says Peters. "Our hypothesis is that biomineralization evolved as a biogeochemical response to an increased influx of continental weathering products during the last stages in the formation of the Great Unconformity." The influx of ions to the oceans also likely posed a challenge to the organisms living there. "Your body has to keep a balance of these ions in order to function properly," Peters explains. "If you have too much of one you have to get rid of it, and one way to get rid of it is to make a mineral." The fossil record shows that the three major biominerals  calcium phosphate, now found in bones and teeth; calcium carbonate, in invertebrate shells; and silicon dioxide, in radiolarians  appeared more or less simultaneously around this time and in a diverse array of distantly related organisms. 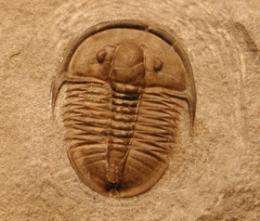 The time lag between the first appearance of animals and their subsequent acquisition of biominerals in the Cambrian is notable, Peters says. "It's likely biomineralization didn't evolve for something, it evolved in response to something  in this case, changing seawater chemistry during the formation of the Great Unconformity. Then once that happened, evolution took it in another direction." Today those biominerals play essential roles as varied as protection (shells and spines), stability (bones), and predation (teeth and claws). "This feature explains a lot of lingering questions in different arenas, including the odd occurrences of many types of sedimentary rocks and a very remarkable style of fossil preservation. And we can't help but think this was very influential for early developing life at the time," Gaines says. "The French composer Claude Debussy said, 'Music is the space between the notes.' I think that is the case here," he says. "The gaps can have more information, in some ways, about the processes driving Earth system change, than the rocks do. It's both together that give the whole picture." Bias in the rock record? I wonder if the researchers found any evidence of an oceanic PH shift towards alkalinity during the "Great Unconformity." The summary hints at it but doesn't say so explicitly. The seas may have simply been too acidic for calcium carbonate to be useful as integument in Pre-Cambrian organisms. A shift towards alkalinity would have opened up a new developmental strategy for life to exploit. If so, the geochemical challenge is to show why the shift occurred.
" ...shallow seas repeatedly advanced and retreated across the North American continent"
Likely this left both plants and animals stranded in tidal pools as well as exposing them to more UV. More mutations and increased survival pressure.